"This deliciously creamy herb sauce is so simple to make using a microwave, but if you do not have one, place your bowl over a pan of simmering water to heat it gently. 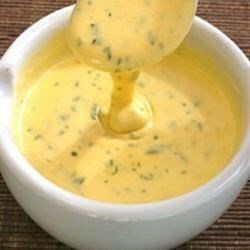 Excellent German recipe for Bernaise sauce. Great on steaks, chicken, vegetables and fish." Place butter in a medium glass bowl, and melt in the microwave, about 30 seconds on High. Whisk in the onion, white wine vinegar, egg yolks, heavy cream and lemon juice. Season with tarragon, parsley, salt, mustard powder and cayenne pepper; mix well. Return to the microwave, and cook for 1 1/2 minutes, or until thickened, stirring until smooth every 20 to 30 seconds. Worked well, I tripled the recipe. My one criticism is that I think there is a bit too much vinegar in the recipe and next time I will cut that part down a bit.